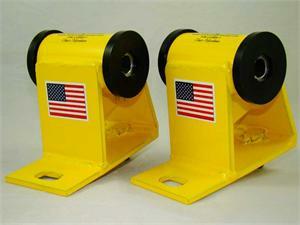 Made in USA: Using USA steel, bushings, hardware, etc. Want Jeep motor mount lifts (MMLs) to help correct driveline angle caused by suspension lift? Doing a tummy tuck or other modification that's impacting drive-line angle? Brown Dog designed these MML to reposition your engine one inch higher than stock (at the cooling fan). This modification results in a change in the driveline angle. The Brown Dog experienced a sagging engine on his own Wrangler YJ. This is why we engineered these replacement MML for extreme strength. You'll find these mounts a serious upgrade from most others, too. We use plate steel and double-weld joints to provide the most strength possible. And, just to make sure, we periodically pull one off the shelf and put it through our 20-Ton Press Test. We have never seen a structural failure on Brown Dog mounts. The Classic Polyurethane bushings in this pair of Brown Dog motor mounts will give your rig a sportier feel. If the bushings ever start to wear, replacements are available from Brown Dog Offroad. Prefer Ultra-Flex Rubber bushings? 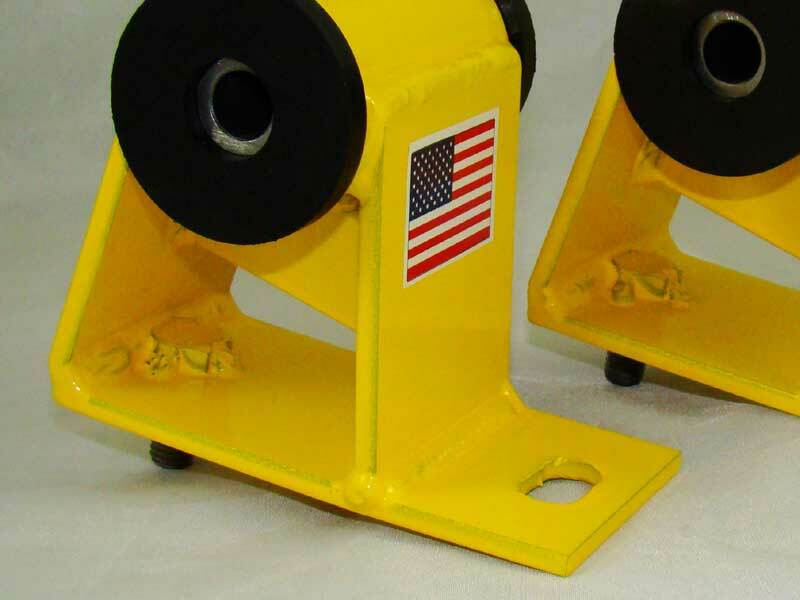 We offer all motor mounts and motor mount lifts with either polyurethane or rubber to match your preference. Not sure which is for you? Click here. Backed by Brown Dog Promise. Brown Dog motor mounts will be the last set of mounts you'll need. The Brown Dog gives you his promise. Engine is lifted 1" at stock cooling fan. 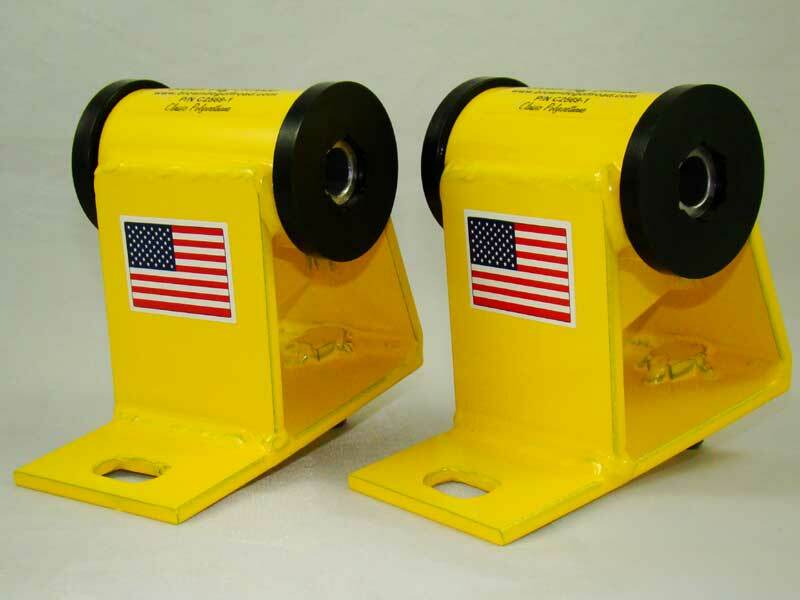 Left side mounts bolt directly to the pylons, in the identical position of the stock mounts. Right side bolts to cradle sandwiched between the pylon and motor mount lift. Carefully inspect engine brackets for any excess wear, especially cracks. The original brackets weren't designed to handle the strength of these high-performance motor mounts. If engine brackets need replaced and you have a YJ, order the X2569-1 Kit which includes motor mounts, engine brackets and the mount support cradle for 2.5L XJ, MJ and YJ. If you have a 2.5L TJ, order K2569-1 which does not include a cradle. Sorry, brackets currently not available for 2.4L Gas, 2.1L Diesel or 2.8L V6. You may experience minor interference between the MML and the original Jeep engine bracket lip. If you experience some minor interference, we suggest grinding the lip until the MML clears. If more than minor grinding is required, contact us at 866-401-3877 or contact us. X2569-1 Upgrade Kit includes MML, engine brackets, and driver-side cradle for Jeep 1991-1996 2.5L YJ, XJ and MJ. Sorry, at this time Brown Dog does not make brackets for 2.4L I4 Gas, 2.1L I4 Diesel, nor 2.8L V6. Tighten through-bolts (bolt that goes through bracket arms and motor mount) snug. Do NOT over-tighten locknuts on through-bolts. Bolts to pylons should be tightened like most others on your Jeep frame. Nice and tight. If you have any questions during installation or believe a part will not fit, do NOT alter the part. Call Brown Dog, 866 401-3877. We have extended support to assist with installation.